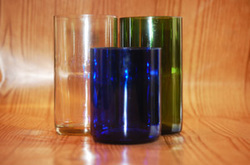 Rebootle creates one of a kind, handmade, casual glassware for the eco-conscious consumer. They are both functional and beautiful, as well as dishwasher safe. Rebootle™ is a small business based in Forest Grove Oregon, aimed at making a big impact on the Oregon Wine Industries carbon footprint! We reclaim wine bottles from Oregon’s Wine Country that are landfill bound, and give them a second chance at life! We use alternative energy to assist in the production of our line, and transport raw materials and finished product in environmentally friendly vehicles. We believe we can make a difference in protecting our most valuable asset, our environment.